Led by young superstars Jose Fernandez and Giancarlo Stanton, the Marlins will likely flirt with .500 once again, but a winning season may still be beyond their grasp. This week, SI.com is previewing all 30 MLB teams for the 2016 season, counting down to the No. 1 team in the league. At No. 19: the Miami Marlins. Starting last year with a 12–12 record, the Marlins managed to hang at the top of the NL East standings for the first month of the season as spectators were left wondering how the Fish were besting the division favorites. But by mid-May, Miami's glimmer of hope was gone, as the Marlins resumed losing and assumed their familiar position near the bottom of the pile. Their streak of consecutive years with a losing record reached six in 2015, but '16 could be the year they break from tradition. Full seasons from Giancarlo Stanton and Jose Fernandez will give the team pillars around which to build. Fernandez enjoyed a successful return to the mound from 2014 Tommy John surgery, posting a 2.92 ERA over 11 starts in the back half of the season. But as one star returned, another departed: Stanton’s season ended just before Fernandez’s began due to a broken hand. Before that, however, the burly rightfielder clobbered 27 home runs and kept the Marlins’ offense among the top half of teams for the first three months of the season. Positive production from both Stanton and Fernandez this season will be vital to the Marlins’ chances at winning. Miami stayed busy in the off-season, bringing in pitchers Wei-Yin Chen and Edwin Jackson to absorb the loss of Henderson Alvarez, who was by far the team’s most valuable pitcher in 2014 before a shoulder injury derailed his '15 season. But even more important than any on-field acquisitions were the changes to the coaching staff. Former Dodgers manager Don Mattingly brings five years of managerial experience and a 446–363 career record to Miami, and former slugger Barry Bonds was hired to revitalize the Marlins’ bats as a hitting coach alongside veteran journeyman Frank Menechino. Expect Bonds and Menechino to encourage increased patience at the plate (in 2001, Bonds and Menechino swung at the lowest percentage of pitches of all major leaguers and still reached base at a combined .447 rate). The Marlins were among the top 10 teams most inclined to swing at the first pitch last season but had just a .299 on-base percentage when they swung compared with a .314 OBP when they watched the first pitch go by. Bonds’s influence could coax greatness out of the Marlins’ young lineup (their average age of 27.5 ranks tenth-youngest of teams), with players already expressing their excitement at the opportunity to learn from him. Though the division is presumably the Nationals' or the Mets' to take, a winning record is an incredibly achievable goal for Miami. The off-season changes could go a long way toward separating the Marlins from the middling Braves and Phillies at the bottom of the division and showing they can contend with the top teams in the East. Each year the Marlins seem to improve, and yet each year they somehow find a way to disappoint. Miami finished last season with a .260/.310/.384 slash line, with its team batting average ranking in the top 10 but the lineup's on-base and slugging percentages lagging in the bottom third. Getting hits doesn’t matter if those players never score, and the Marlins averaged just 3.8 runs per game, second worst in baseball just ahead of the Braves. They didn’t sign any big bats to help boost those numbers, and expecting big jumps in their stats after just a few months of hitting lessons from Bonds seems unrealistic. That offense could sag even further with regression from last year’s batting champion, Dee Gordon. A career .272 hitter before logging last season’s NL-best .333 average, Gordon is likely to trend back toward his career norm. On the pitching side, the Marlins' ERA sat at 4.02, with the starters contributing a 4.25 mark and the relievers finishing at 3.66. The starting ERA should drop this year thanks to the presence of Fernandez and Chen, but we still don’t know what to expect from Fernandez’s arm in his first full season since Tommy John. The bullpen, meanwhile, seemed to be in decent shape until the Marlins announced earlier this month that flame-throwing reliever Carter Capps, who posted a 1.16 ERA over 30 games last season, would be lost for the year after suffering a torn elbow ligament of his own. There are still several question marks hovering over this Marlins team, and while no one would be surprised or disappointed with a third-place finish, it will be the number of games separating them from the top and bottom of the division that shows whether they are evolving into true contenders. Last season, the Marlins finished much closer to the 63–99 Phillies (eight games ahead) than they did to the division champion Mets (19 games behind). If they can keep pace with the Mets and the Nationals this year, it could foretell an upset in the dynamic of the division in the seasons to come. 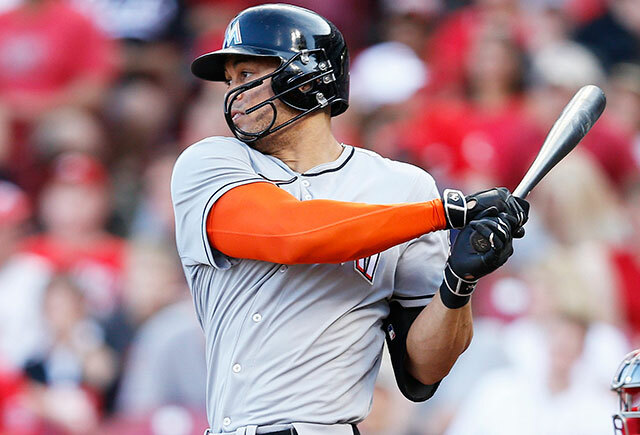 Whether Stanton can remain healthy this season will make all the difference for the Marlins. In 2014—his closest to a full season since '11—he played in 145 games, led the league in home runs, finished second in the NL MVP voting and was worth 6.5 Wins Above Replacement. The electricity Stanton provides to the Marlins when he is healthy enough to remain in the lineup is undeniable, but the Marlins’ $300 million man has averaged just 114 games over his past four seasons. He strained a hamstring in 2013, took a fastball to the face in '14 and broke his hand last year, and also underwent bone chip removal surgery in his knee in '12; lingering knee pain has slowed his start this spring. "This guy came out of nowhere last year, crushing 23 home runs, and doing some damage in that graveyard in Miami is impressive. He’s a mammoth and can swing the pole, [and] if you make a mistake to him, he's going to crush it. But now we’ll see if he can make adjustments—I’m saying he won’t. The guy hit all his home runs against righties last year—I think this guy is pretty hopeless against lefties. He'll hit a bomb and everyone will go crazy, but then he'll have 20 at-bats where he looks pretty lost. He's a poor man's Matt Stairs." "Say what you want about defensive metrics—and I’ll say they’re full of s---—Hechavarria is a guy who can play on the defensive side. I don't think this guy gets enough love for his glove: He's one of the better fielders out there. He’s maturing as a hitter, too, cutting down on his strikeouts. This guy gets lost in the shuffle with all the flash on this team, but he does a little of everything well, and as he's hitting his prime—he's still just 26. I think there's some nice upside here.​"